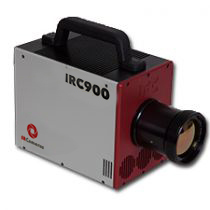 With a broad spectral response from 960 nm to 5000 nm, and the unmatched sensitivity of a cooled InSb sensor, the IRC906-SWIR cameras is designed to address the most challenging applications for short wave infrared imagers. More versatile than traditional InGaAs cameras, the extended wavelength response of the IRC906-SWIR makes it indispensable for spectroscopy, infrared search and track, target signature, astronomy, laser detection & characterization, and other demanding SWIR imaging requirements. Based on a digital focalplane technology, the 640×512 resolution IRC906-SWIR operates at frame rates of up to 119 Hz with cooled InSb sensitivity, low noise and no pixel crosstalk or blooming. The IRC906-SWIR features simultaneous 14-bit CameraLink and Gigabit Ethernet digital outputs, along with analog HDMI, GPS and RG-B inputs are available as options. Copyright © 2019 IRCameras LLC. All rights reserved.